Home People Cyclists Touring India To Support Polio Eradication are in Udaipur, Know Why! 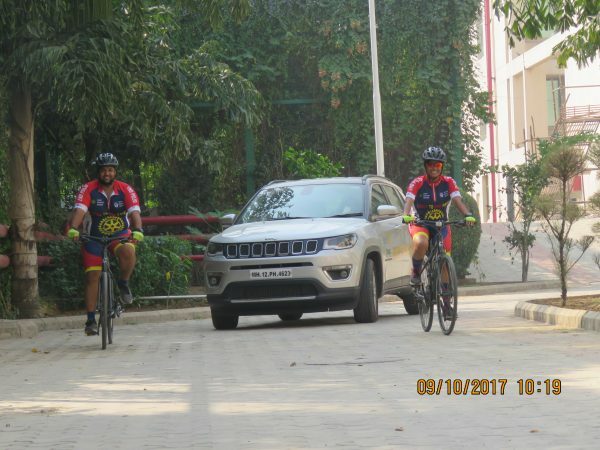 Cyclists Touring India To Support Polio Eradication are in Udaipur, Know Why! 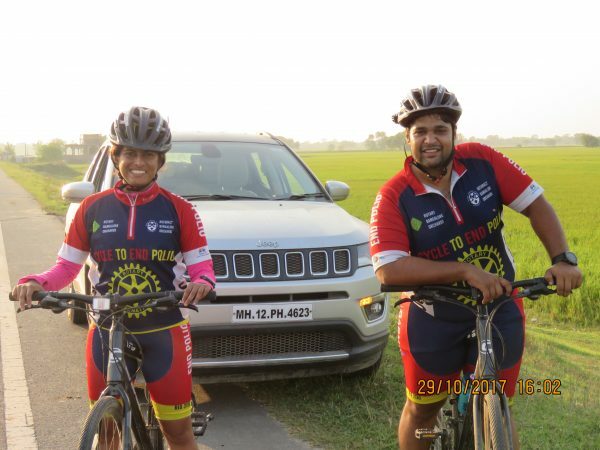 This duo, Pavan, and Bhagyashree are cycling across India to spread awareness about Polio. They are in Udaipur today and are quite grateful for their journey so far. I had a chance to have a conversation with Pavan. Their enthusiasm and zeal left me amazed. Have a read of my inspiring conversation with M.J. Pavan. Tell me about you and your mate; how did you come together to cycle across the country? I am M.J.Pavan, a mechanical engineer from Bangalore. My cycling mate is Bhagyashree Sawant who is an MSc in Phycology. I have cycled from Delhi to Leh in 14 days covering 1400km and Bhagyashree has climbed Mount Everest twice up to 8000 meters. We both are in the same Rotaract club that is the Rotaract club of Bangalore Orchards. Since we both were into adventure sports we took up this expedition where we can think of using our expertise for a noble cause. When did you start this tour? We started our tour on 2nd of October, from Palampur, Himachal Pradesh. Tell us about your journey so far? Till now it’s been a great journey. We are meeting new people every day and it is a great opportunity for us to come across and know about different cultures in India. Since India is diverse in all aspects every day is a new experience for us. What made you opt for this? Most of the people in India are not much aware of polio. If we all are healthy and free from polio today it is because of Rotary International which has worked selflessly to eradicate this disease from India hence we are carrying the public image of Rotary contribution in making India polio-free. Polio is caused by contaminated water and it is still there in 2 countries in the world. Since we were part of Rotary it is our duty to create as much awareness as possible to get vaccination done for all the children below 5 years or else even a single relapse will be a threat to the whole nation. Hence we are visiting school across the country and spreading awareness about cleanliness and hygiene. We opted for cycling because children get inspired very soon when they hear about our expedition and see us on cycle. Any experience during the course of this tour which is worth mentioning? We had a lot of experience during the course of this journey. One such astounding fact that we came across was in Basti, a place in Bihar. We met a doctor who is a rotary member, he was around 75+ years old and serving patients free of cost since the time he became a doctor. India was declared as polio-free in 2015 but in Basti, it was polio-free in 2013 itself. This was something we weren’t aware of and was a new addition to our overall experience. How does it feel to travel through the country for a cause? It feels great to be a part of a noble cause and travel for the same. It gives a lot of experience as we do not know the road conditions or climate. We build confidence, management skills and learn other necessary things which are required for life. 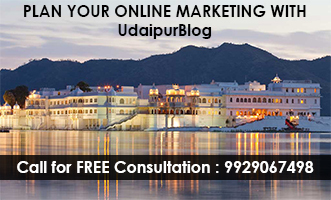 Where are you planning to go next, after Udaipur? We are going towards Ahmedabad from Udaipur. How are you coping up with the weather in Udaipur and in other parts of India? Weather is challenging. But we are prepared for everything; we have clothing essentials for all weather condition. How many kilometers will you cover and in what time at the end of this tour? 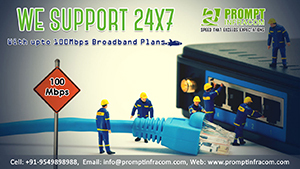 We are planning to cover 20000km across India and we are planning to finish in the first week of March. We would like to extend our special thanks to Rotary Club of Udaipur for the royal hospitality and giving us an opportunity to meet the prince of Udaipur LakshayRaj Singh Mewar.